In a previous post, I examined the New York Times’ (NYT) use of racial labels for African Americans using NYT Labs’ tool Chronicle. In this post, I expand on that work and look at another racial minority in the US: Latin@s. Latin@s is my preferred label for the group, although I have rarely seen it used outside of certain academic circles. The @ symbol here attempts to represent both men (Latinos) and women (Latinas). As I discussed in my previous post, the act of applying a label to a group of people (even defining individuals as belonging to a group) is a contentious and controversial act. This issue is even more controversial for Latin@s than it is for African Americans for a number of reasons. For example, while the Trans-Atlantic slave trade has left most African Americans without clear ties to any particular present day African nation, divisions within the category of Latin@s are readily apparent, for example, for Mexican Americans and Cuban Americans. According to a recent Pew survey, many people who might be labelled Latin@ prefer to be identified by their country of origin or heritage. 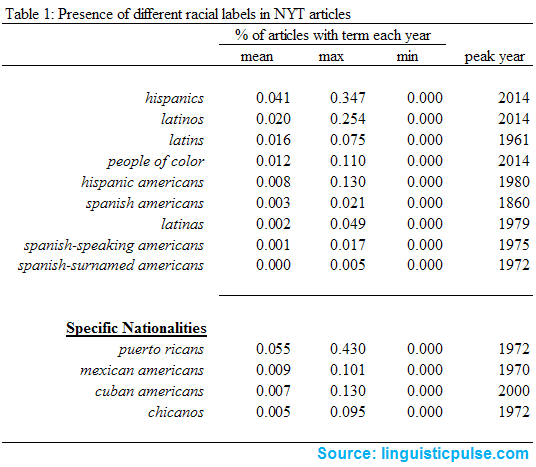 With such complexities in mind, I examined the NYT’s use of different racial labels for Latin@s in the United States. A fairly comprehensive list is presented below. Table 1 below presents some basic numbers for all of these labels. A few words of caution are warranted here. First, in examining how the NYT used Latins, I found that, at times, the term clearly referred to people living in the United States, such as in the 1970 article “Latins Integrating in Jersey Town”, in which Latin is used clearly as an umbrella term for, in the article’s own words, “Puerto Ricans, Cubans, Dominicans, Colombians, and other Latins” who are living in the US. In many other cases, however, the term is used more clearly to refer to people living in Latin American countries like in the 1965 article “Latins Make a Major Gain on Pact to Ban Atom Bomb”, which uses the term to talk about the people and governments of Latin American countries. Second, the term Spanish-Americans might reasonably be considered a reference to a specific nationality: US residents or citizens originating from Spain. However, I never observed the term used unambiguously in this way. Rather, two other uses emerged. The earlier usage is exemplified by an 1876 article discussing Argentina, “The Republic of La Plata”, in which the term is apparently used to reference people from all parts of the Americas previously colonized by Spain. I observed a later usage of the term in a 1960 article about national elections, commenting that “most of these [Catholics] are Spanish-Americans whose political allegiance is still strong to the Democratic senior senator”. Here Spanish-Americans seems to fulfill a function similar to Latin@s, acting as a racial umbrella term. Undoubtedly, similar complexities exist for other terms like Latinos and Hispanics. Indeed, these two terms are not always used synonymously (they differ especially in terms of whether they incorporate people from Spain or Brazil), although, in my perusal of NYT writing, I did not observe any place where the terms were used for contrasting purposes. The plot below shows a sampling of NYT writers’ use of these terms since the 1850s. Probably the most striking aspect of these plots is how clearly they show the emergence of Latin@ groups in NYT writing in the 1960s and 1970s and their gradual increase in prominence in the NYT’s reporting due to the group’s ever-growing political clout. In the one hundred years prior, the NYT only infrequently mentioned this group (or these groups) by any of these names. Beginning in the 1960s, the NYT began to use a number of different umbrella terms to refer to Latin@s, as illustrated in the plot below. 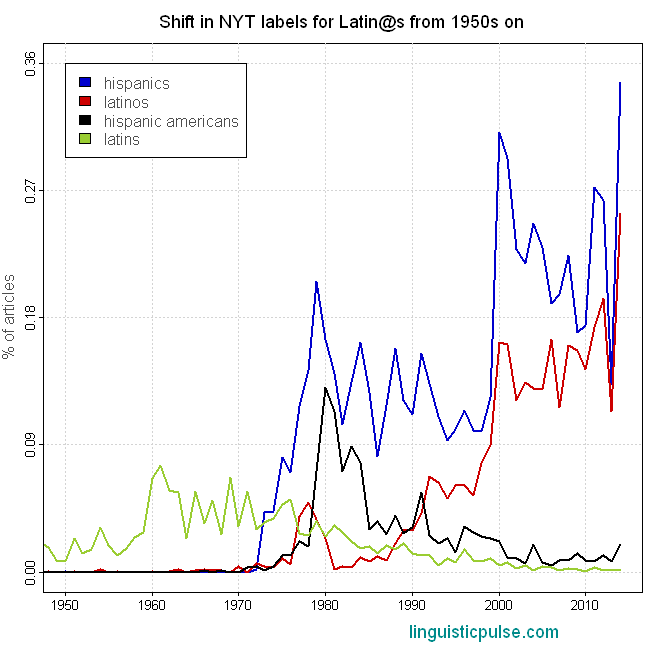 The 1960s saw a rise in the NYT’s use of Latins, which appears to have been spurred by Latin@ political activity during the Civil Rights Movement. 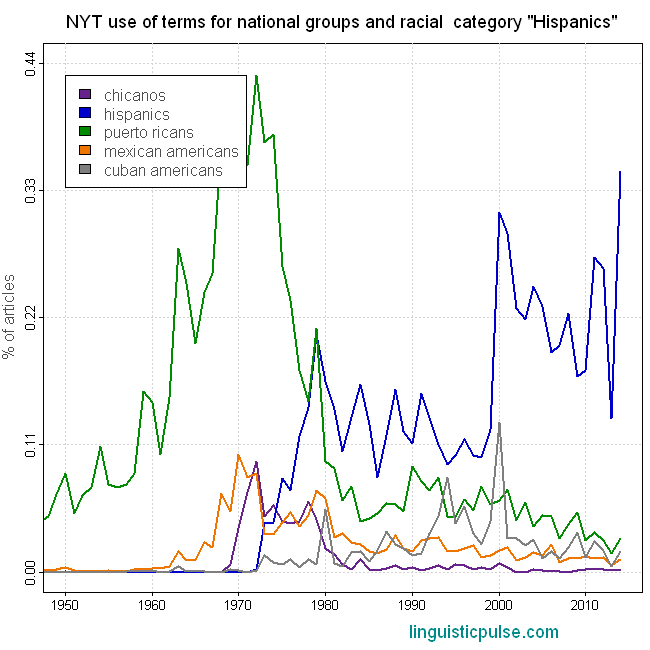 In the 1970s, Latins began to decline in NYT usage and was quickly superseded by the term Hispanics, which has been the NYT’s preferred term ever since, although it received competition from Hispanic Americans in the 1980s and Latinos starting in the 2000s. Today, Hispanics is the NYT’s first choice of terms for this group, although Latinos is a strong second. It is also worth pointing out that the rise of the umbrella terms Hispanics and Latinos seems to correspond with increasing discussion of the political influence of Latin@ groups. Notably, if you look at the line for Hispanics, you’ll see that there is a peak every four years for presidential elections in 2000, 2004, 2008, and 2012, in which NYT and other news outlets fixated on the voting patterns of Latin@s.
The NYT and other news outlets have not always presented Latin@s as a relatively unified group. 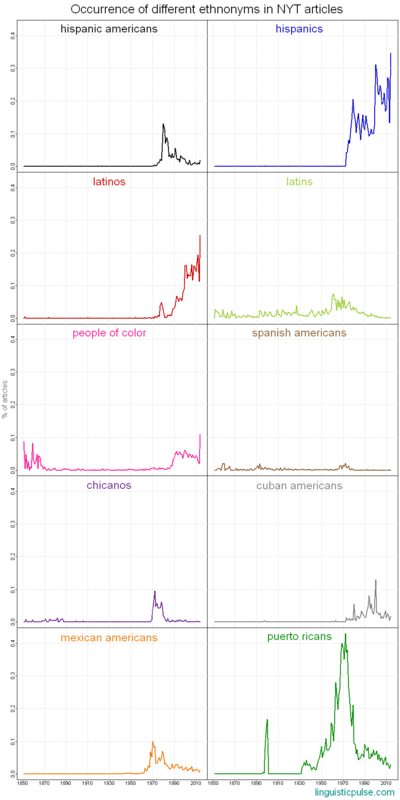 Rather, the plot below shows the rise and fall of four terms for four different more restricted groups: Puerto Ricans, Chicanos, Mexican Americans, and Cuban Americans. The plot above illustrates how the decline in usage of Puerto Ricans, Mexican Americans, and Chicanos appears to coincide with the rise of Hispanics throughout the 1970s and into the 1980s. One important observation that this trend appears to underscore is that racial groups are not pre-existing or natural. They are created, and this is done through human efforts like the writing of the NYT. The NYT’s move away from labels for more specific groups like Puerto Ricans helps to reinforce our understanding of diverse peoples as belonging to a single larger category. The term Cuban Americans appears to be an exception to the trend that the other terms followed, especially with its sudden rise in 2000 caused by the Elián González controversy and the presidential election. However, this term has also seen a decline from its peak, while both Hispanics and Latinos have both risen in the past 14 years, suggesting the absorption of Cuban Americans into these umbrella terms in NYT writing. In the end, the increasing frequency of umbrella terms for Latin@ groups and the decreasing frequency of the terms for specific nationalities suggests a more recent tendency in NYT writing to present Latin@s as a more unified racial group. On the one hand, thinking of Latin@s as a racial group could, in some ways, be in their interests, since there can be strength in numbers. The NYT articles’ fixation on Latin@ voters as an important bloc serves as evidence of how a larger voting bloc could help gain attention for issues important to many of the group’s members. On the other hand, the use of terms like Latinos and Hispanics (and Latin@s for that matter) clearly ignores the internal heterogeneity of the group. Indeed, as I mentioned previously, Latin@s themselves appear to prefer to emphasize their diverse national identities rather than to self-identify using an umbrella racial term. I’ve been thinking about this a fair amount lately, trying to decide which term I should actually use. How would you pronounce “Latin@s”? Haha! I’ve never heard anyone try to say “Latin@s”. I think the best policy is probably either (a) “Latinas and Latinos” or (b) alternating between the two within the course of a longer speech like a conference presentation. At least in Spanish, the usual practice is to expand written -@ to a disjunction (so “un compañer@” would be spoken as “un compañero o compañera”) and -@s to a coordination (so “compañer@s” would be “compañeras y compañeros”), which matches Nic’s usage. On an unrelated note: both in your previous post and this, I notice a marked drop in racial labels in 2013. Do you have any hypotheses as to why? Alon, that’s a really interesting question. Unfortunately, the NYT database that I’m using to find the articles only goes up to 2010, so I can’t really see what the NYT was reporting on that year with regards to racial groups. The dip that you point to is somewhat surprising to me, given that the George Zimmerman trial was in 2013. For me at least it felt like a year in which discussion of race was prominent. 2013 has I think a few things working against it though: (1) it’s neither a presidential election year nor a year leading up to it, (2) there has been a continuing general decline in the NYT’s mention of racial groups since the Civil Rights Movement, and (3) it pre-dates protests and other events that occurred in 2014 in the wake of Ferguson, MO (which I think are driving the sudden increase that occurs in 2014). I’m wondering whether you or anyone else sees something I’m missing here though.